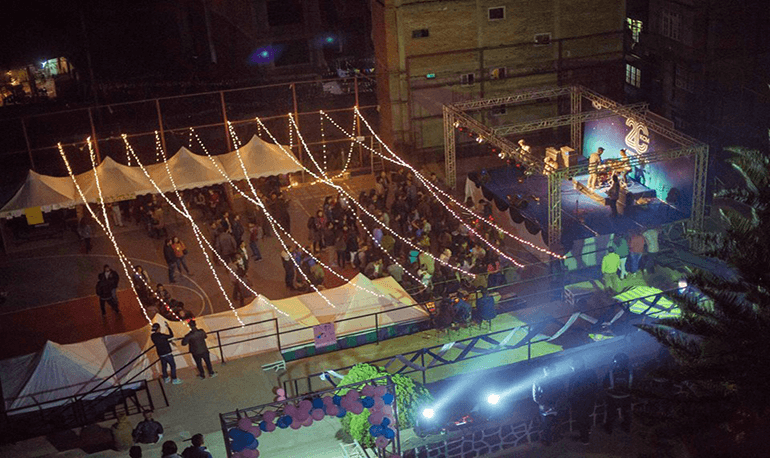 Kathmandu College of Management (KCM) organized a festival at KCM basketball court, on 12th November, 2016 to celebrate its 20th year of establishment involving the students, faculty members and alumni. The main purpose of this event was to provide an exciting opportunity to reflect the past, celebrate the present and move forward with a renewed dedication to all the achievements until today. The grand festival showcased the wide array of delicious cuisines, lively music, thrilling games and variety of refreshments. The attendees had a whole new experience of futsal with a twist i.e. Aqua Futsal. The stage was highlighted with the voice of Kramasha along with its crew. Similarly,the students and alumni added to the fun with their lively performance. "KCM brought back fun memories of my college days and gave me a chance to spend a great day with my long lost friends" said Mr. Gaurav Man Sherchan, President of KCM Alumini Association. Other stalls set up by the seven clubs and students served variety of foods such as panipuri, momos, cupcakes, sodas and barbeque. Likewise, mini games such as bingo, mini-golf, foot bowling, nail art and face painting added non-stop fun for the entire attendees.